Is there anything in your closet you find yourself reaching for again and again? We’ve made our fair share of tailored clothing (like this Cashmerette Trench Coat) as well as comfy loungewear (I practically live in the True Bias Hudson Pants). But we’ve also made a handful of garments we’d call wardrobe staples, and they tend to be those clothes that fit well, are comfortable, and have versatility. 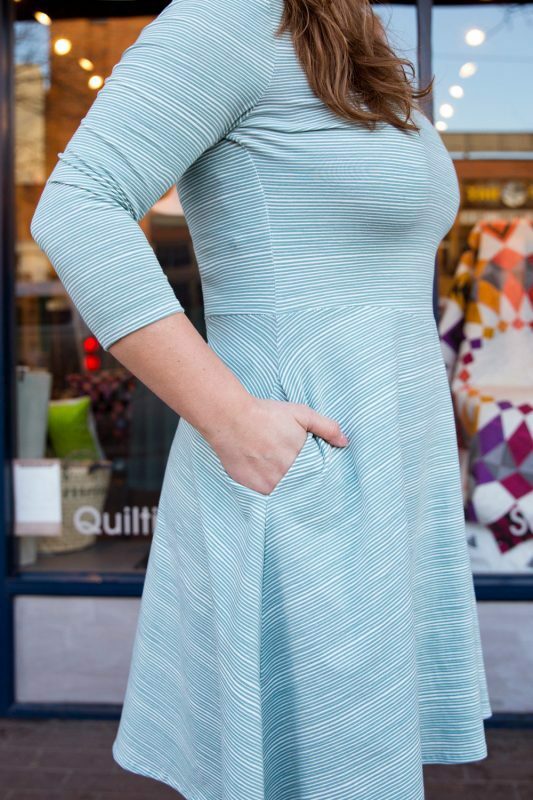 Our newest wardrobe staple is bound to be the Sew Liberated Stasia Dress, a sweet little number that Bonnie made with zero (yes, you read that right, zero) alterations. I think that’s a first for her, and it speaks to the great drafting of this pattern! Hooray for the cute and versatile Sew Liberated Stasia! Many of us feel most comfortable wearing clothing with some stretch. For this dress, Bonnie used an Avalana Jersey Knit from Stof, a Danish company making high-quality fabrics. It contains 94% cotton and 6% elastane (spandex), so it has a soft hand and great recovery. (That means no saggy elbows at the end of the day!) It’s a medium-weight fabric that’s great for T-shirts and dresses and isn’t as clingy as a thinner rayon knit. This particular fabric has a tiny stripe in a subtle shade of sage. The (optional) pockets are roomy and useful. The neckline is scooped in the front and the back. This pattern is relatively simple with some cute features. It has a slight V at the bodice, a nice flared skirt, and endless options for sleeve length, dress length, and pockets. You can even make it a T-shirt! The flattering design also features a scooped neckline in both the front and the back. It fits Bess, our photographer, perfectly, which is why this time we made her be in front of the camera instead of behind it! This is a quick sew for an advanced beginner. The Stof knit is easy to sew up on a regular sewing machine using a zig-zag stitch (with optional stay tape for extra stabilization). Have access to a serger? You could whip this little dress up in no time! 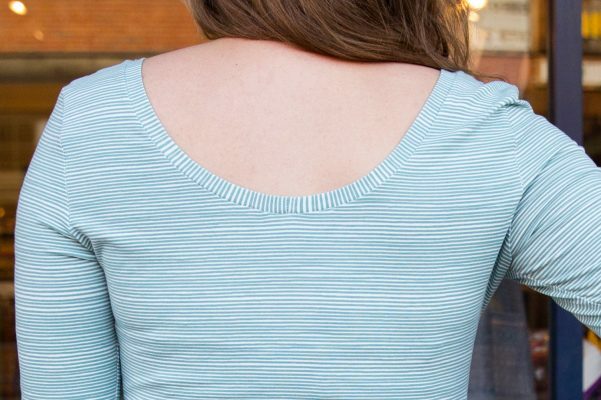 We’ve discovered yet another Sew Liberated pattern we love, and can’t wait to make one in every color! 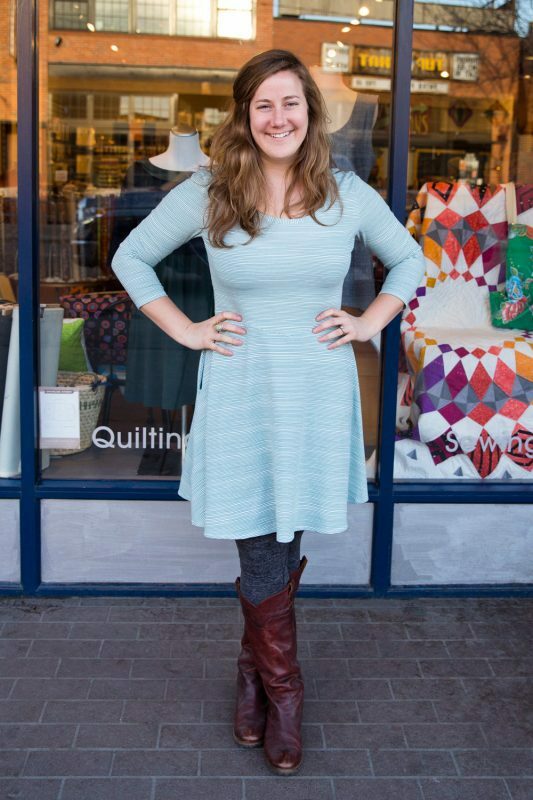 This entry was posted in Dresses, Pattern Reviews and tagged Knits, Sew Liberated, Stasia.